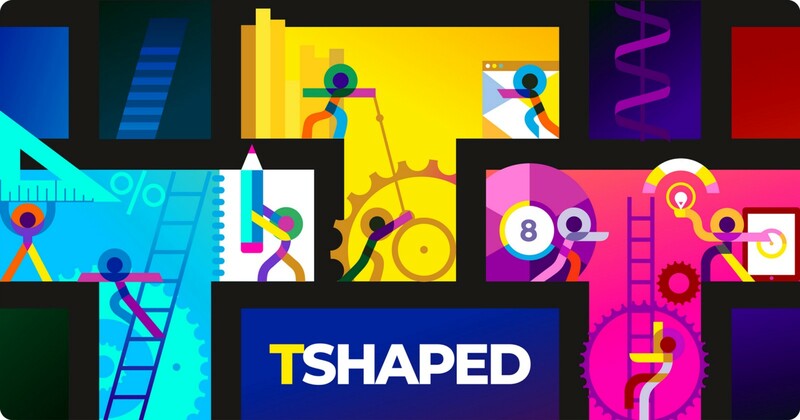 In versatile handbooks, white papers and other publications, you can frequently encounter a particular specialist attribute known as T-shape. In construction, there are such terms as T-shape pipe or T-shape beam. In product development, this term of art refers personal competence because “experienced” and “skillful” cannot capture the full spectrum of an individual’s abilities. So, the T-letter metaphor was invented. As you might expect, the term’s origin is recruitment. HRs needed a good word to convey a diversity of knowledge, skills, background, and experience. As a result, in the early 90s, the concept of vertical and horizontal classification of skills came out. T-shaped refers to someone who possesses deep skills along with a broad base of shallow ones. The concept splits the T letter into two bars — horizontal and vertical. The vertical bar comprises a bundle of deep knowledge in a single area to facilitate the creative process. It means that being a niche professional (designer, architect, social scientist, business specialist, mechanical engineer, etc.) combined with related skills and experience makes your I-bar longer. Although they are highly valuable, I-shaped people are likely to fail in workplaces that are associated with a high level of collaborative labor. At the same time, those who possess experience in different professional ecosystems develop their T-shaped competencies and are more in demand. Correspondingly, the horizontal bar includes a range of skills in the areas unrelated to the primary one. Nevertheless, the breadth of these skills allows you to cooperate with representatives of other fields and share a common language with them. For this reason, the horizontal characteristic includes two essential things — empathy and working enthusiasm. The first one denotes a person’s ability to stand in someone else’s shoes and see things from a different perspective. Being enthusiastic about other disciplines and professional environments is always an advantage since the knowledge-hungry employees are worth their weight in gold. Those who tend to have a wide horizontal bar not supported by discernible specialties are known as dash-shaped people or generalists. Do you believe that a team of top-class experts can be a nightmare for a software company? It can if the experts are tailored to a single field and have no understanding of the adjacent ones. On that account, the IT industry is rapidly switching to a T-shaped professional model. A regular development process rests upon three pillars: product manager, engineer, and designer. The more complex projects add to this list with marketing experts, QA engineers, versatile business analysts, SEO specialists, etc. Despite the apparent simplicity and accuracy of production flow, it proves low efficiency in practice. Collaboration between an engineer and a designer is limited since they have to wait for the completion of adjacent tasks to proceed with their own work. If their ideas are not synchronized, it takes a while to get a result. The T-shaped approach, on the other hand, allows for a reduction of time expenses and a substantial efficiency growth due to the involvement of professionals with broad adjacent expertise. We can apply the concept to not only people but also companies. What is the point of having a team of T-shaped professionals that cannot completely fulfill their potential due to an inappropriate organization structure? On that account, numerous companies are switching to the T-shaped management. Ties-strengthening activities like conventions, seminars, workshops, etc. Value of individual participation in collective activities. If you can count at least a half of the described points, your team is on the right path. As for Railsware, we chose a version of holacracy as our organizational structure. Unlike the classical hierarchical approach, the structure is based on teams, which have equal rights and responsibilities for decisions. The “position” concept is replaced with the “role” concept, which allows employees to unlock their potential in different fields. Every T-shaped Railswarian participates in versatile contexts of the company life. It is difficult to believe that a team of an engineer and designer could be the perfect mixture for your project. But, this statement is true if both employees possess T-shaped skills. Their collaboration foresees no long iteration but a significant increase in performance. A product manager often accompanies this couple with such functions as putting into shape a client’s unstructured input, managing the project’s roadmap, prioritizing goals, etc. However, engineer+designer (each with sufficient broad expertise) can be enough to build a flexible squad. And Railsware does have such experience. If you visit our website contact form, you will see a list of services provided by the company. When selecting any of options, e.g. iOS prototype, a budget calculator appears on the right. It only took several hours to complete the entire UI of this page due to our T-shaped designer and his broad expertise in HTML, CSS, and JS. An the engineer had no severe troubles with brushing up the code to ensure the best UX for our website visitors. The collaboration between Railswarians was at a maximum effect and the production process improved through the gradual destruction of the wall between creativity and technicality. The T-shape concept proved its efficiency in practice. Each squad member has a spacious mind and can discover new areas for personal development: designers get in the product building process, and engineers absorb roles of product managers, QA experts, and designers. Regardless of the industry you are involved in, constant improvement and acquisition of new knowledge will contribute to your personal and professional prosperity. On that account, the enlargement of both your vertical and horizontal bars should be an essential task of developing the T-shaped knowledge. Having a decent depth of knowledge in one discipline does not mean to break off the development in that area. Your vertical bar can always become longer, i.e. your deep expertise evolves with time. You should keep in touch with information sources like versatile conferences, meetings, niche magazines, forums, as well as dedicated communities related to your domain knowledge. T in T-shaped often refers to “team” since it provides an improved level of collaboration. However, T-shaped leadership does not appear to be the only option when a company is in search of a top-level manager. If there is a need for a balanced combination of deep and broad expertise together with high credibility and ability to manage a diverse team, the notion of X-shaped arises. Not all professionals strive to overcome the T stage and become an X-shaped leader. That category foresees less focus on original expertise and more emphasis on strategy and management. To some extent, the X-shaped qualities value a proliferation horizontal skills over deep expertise. With this blog post, we do not want to focus on the shortcomings of I-shaped professionals compared to T-shaped ones. The idea is to encourage qualified specialists to broaden their expertise in multiple areas. Today, collaboration underlies the success of most prominent businesses and startups. Employees interact with each other on numerous levels of organizational structure. People possessing T-shaped skills contribute to the prosperity of their company and industry as a whole. So, make up your mind what sort of specialist you want to be and aspire to new knowledge. Originally published at railsware.com on May 25, 2018.